9/2/16 update: In light of the sheet mask packing scandal that has been the talk of the AB community, I thought it’d be fun to feature some masks that aren’t affected. My Beauty Diary is a Taiwanese brand whose manufacturing processes are automated and controlled within the company’s factories, as you can see in this video here. South Korea is inarguably the leader of the current wave of Western interest in Asian cosmetics (there’s a reason the term is K-Beauty not T-Beauty or J-Beauty or C-Beauty, after all), but that doesn’t mean other countries don’t offer standout products–or stand out in particular categories. Affiliate links in this post are marked with an asterisk(*). Take Taiwan, for example. The land of my people doesn’t just produce pretty much the world’s best street food ever. Although it does. Except for stinky tofu. Gross. Taiwan is also home to companies producing truly stellar face masks, from Annie’s Way jelly masks to an insane variety of effective yet affordably priced sheet masks. The aforementioned Annie’s Way makes them (and thanks to Unboxing Beauty, I’ll be trying the seaweed variety soon!). I’m just starting to get into Lovemore and My Scheming thanks to yet more generous AB friends. I’ve been lusting after L’Herboflore and Maskingdom ever since I first laid eyes on their gorgeous, gorgeous packaging. And I’ve been a fan of My Beauty Diary since I first started out on my skincare journey. So when some of the 2015 My Beauty Diary masks began to show up on Amazon Prime, I jumped on them. I liked the classic MBDs just fine. Would the redesign and reformulation be an upgrade…or a bust? First, let’s take a look at what makes the 2015 My Beauty Diary sheet masks different from their predecessors! Varieties like Liposome Hyaluronic Acid, Imperial Bird’s Nest, and Squalene come in boxes of 8 or 10, and often that’s just not enough. My Beauty Diary 2015: What’s New? 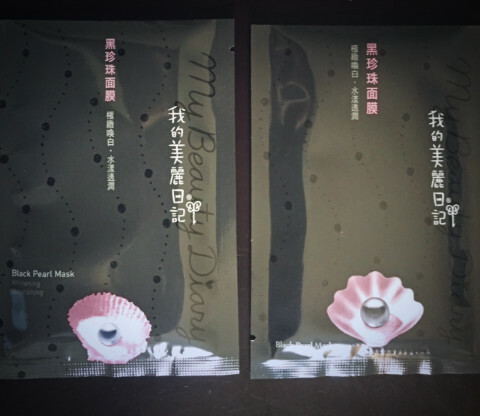 Back when the 2015 MBD masks first hit the market, Redditor /u/GiveMeABreak25 contributed an awesome guest review of the 2015 Black Pearl masks and by the way girl, Fiddy still luhhh you that looked into some of the differences between the old and new My Beauty Diary masks. The first differences you may notice are on the packaging. Specifically, the images used to illustrate the masks’ featured ingredients. For some reason I don’t understand, My Beauty Diary’s aesthetic used to rely heavily on very pixelated graphics. So pixelated that an unsuspecting consumer might mistake the genuine article for a badly copied counterfeit. The 2015 MBDs have swapped out those weird graphics for slicker and smoother new ones. Funnily enough, I’ve now seen worried consumers wondering whether their new MBDs are fake because the graphics are so much clearer. It’s the circle of life. The other significant differences lie in the mask sheets themselves. The old MBD mask sheets were made of a smooth, moderately thick material. The new MBD mask sheets are thin, stretchy, and translucent, much more like the thin silk sheet masks other brands are making popular now. The new material clings much more closely to facial features and, though thinner than the old versions, seems to hold the same generous amount of essence for the same amount of time. That’s a good thing, in my opinion. One of my favorite features of My Beauty Diary masks is their ability to stay moist for upwards of 45 minutes. I like a mask to give me enough time to get really juicy. The new mask sheets are also cut differently. This is going to be a plus for some but not for others. My Beauty Diary’s 2015 mask sheets are shorter and narrower, with smaller eye and mouth openings and a bottom edge that stops at my jawline instead of needing to be tucked up under my chin. I love the new cut because it gives great coverage around my eyes and mouth, but depending on your face shape and size, you may have to bust out the fancy sheet mask scissors to get a good fit. The essences seem similar if not identical to the old formulations, though I do need to get my hands on some boxes of original recipe MBD to make sure. I don’t remember MBD using laminaria digitata extract as much in their old mask essences, but I could be wrong. In any case, the new My Beauty Diary masks’ ingredients lists remain chock-full of nourishing, antioxidant, brightening, anti-inflammatory, and skin-conditioning extracts and actives. And speaking of essence, these masks contain a very generous amount of it. So generous that you’ll be massaging drips of excess essence into your neck and chest for at least five minutes after you first put one of these masks on. And possibly wiping drips of excess essence out of your eyes. I consider it a small price to pay, but if you wear contacts or have particularly sensitive eyes, apply very carefully. Now that we’ve covered the things all the new My Beauty Diary sheet mask varieties have in common, let’s look at what makes a few of them different! Purpose: Hydration, moisturization, and skin barrier repair. These were the first new My Beauty Diary masks I tried, and they almost put me off of the “upgrade” forever. In the space of 10 minutes, my reaction to my first MBD Squalene mask swung violently from Oooh I love this fit to Oh my God get this off my face. The problem was that the first time I tried the Squalene, my face began itching like I’d just mashed it straight into the scratchiest wool sweater of my childhood nightmares. The itching reminded me strongly of that time I couldn’t take wearing a Hey! Pinkgo Girl lace sheet mask. It felt more like surface irritation than deeper skin inflammation, so I tried to tough it out, but after 20 minutes, I ripped the mask off and called it quits. I figured that the itching might have something to do with the fibers in the new mask sheet material not agreeing with my skin and looked mournfully at my three new boxes of sheet masks in despair. Since that first attempt, however, I’ve used several more of the Squalene sheet masks (not to mention all the Liposome Hyaluronic Acid and Imperial Bird’s Nest masks I’ve gone through) and haven’t experienced anything even remotely close to what I did that first time. I do occasionally get a teeny bit itchy around my jaw when the masks get close to fully dried out–an effect of shrinkage, I imagine–but nothing alarming and nothing that doesn’t go away with a little gentle patting. And that is awesome, because the Squalene masks turn out to be great for irritated, irritable, or compromised skin. Squalene is a skin-identical lipid (and antioxidant, yay) that occurs naturally in our acid mantle. It helps to retain moisture within the skin, contributes to a smooth surface appearance, and may prevent oxidative damage from environmental factors. Oh MBD, why did I ever quit you? I relied on the Squalene masks heavily when I was having a series of unusually persistent eczema flare-ups a few weeks back. They were among the very few products that seemed to actively soothe and repair the rough, bumpy cheeks I was sporting at the time. Amazon appears to be experiencing an extreme shortage of the Squalene masks, but if you really really want to try them out and can’t find them elsewhere, you can purchase them there for $11.87 with free shipping for a box of 8 on Prime*. Purpose: Hydration, intensive brightening and anti-aging. The original Imperial Bird’s Nest masks were among some of my all-time favorite MBD sheet masks, thanks to their incredible brightening and moisturizing effects. I was happy to see that the 2015 Imperial Bird’s Nest masks retain those powers. After 45 minutes with these masks, my skin is always significantly smoother, brighter, bouncier, and more even-toned than it was before. The effects last, too. Mornings after I use these masks, I can easily skip the BB cushion (though I tend not to, because I love the hell out of my IOPE Air Cushion XP and most days I use it just because I want to, also the force of habit is strong in me, but the point is that I could skip my cushion and not look rough, is what I’m trying to say). With all that being said, I won’t be repurchasing these masks, or any other skincare products that contain swiftlet nest extract. Rich with vitamins, minerals, and amino acids, swiftlet nest extract produces fantastic results on my skin, but I’m not comfortable with what I’ve learned about the harvesting process. A comment on my SNP Bird’s Nest Aqua Ampoule Mask review got me interested, and what I’ve read since then hasn’t sat well with me. Rising demand for bird’s nest in recent decades has led to severe overharvesting. While the birds can build additional nests in which to breed after a nest is collected, the overall impact of swiftlet nest collection is negative, particularly on the birds’ reproductive success. While there are surely some suppliers harvesting the nests in a sustainable manner, it’s not possible to tell which brands are using such suppliers and which aren’t. I’m not here to push my particular brand of inconsistent skincare manufacturing ethics on you. I’m by no means a vegan or even vegetarian skincare consumer, after all. Last night I finally achieved my longtime dream of slathering my entire body in snail mucin. (That’s right. I’ve gone full snail.) I’m just saying that for me, the conservation issues around bird’s nest collection do outweigh the cosmetic benefits of the ingredient. If you feel differently, that’s totally okay by me. I just want to make sure you are aware of the process in case that’s something that concerns you. 2015 My Beauty Diary Imperial Bird’s Nest Masks are available in boxes of 10 for $13.48 with free shipping on Amazon Prime*. Hyaluronic acid was one of the first ingredients I recognized as working really well with my skin, so way back in the day when I tried the older My Beauty Diary Hyaluronic Acid masks, I was disappointed to find them disappointing. The original MBD HA masks struck me as being actually less hydrating than pretty much any other flavor of My Beauty Diary that I’d tried and didn’t offer any other noticeable benefits to make up for that weakness. The only reason I bought the 2015 Liposome Hyaluronic Acid masks was because at the time of my shopping, there weren’t that many other flavors that interested me available on Prime. I am so glad I did. In my experience, the difference between these masks and the old Hyaluronic Acid masks is night and day. The Liposome Hyaluronic Acid masks are among the most incredibly plumping sheet masks I’ve ever tried, with the ability to completely smooth out many of my fine expression lines for nearly a day afterwards and to eradicate any dehydration-related lines as well. On top of that, the Liposome Hyaluronic Acid masks offer a noticeable brightening effect and glow thanks to the mild enzyme exfoliation action of the many fruit extracts and sugar maple extracts in the essence. These are my current favorite morning masks for their overall enlivening effect on my face. I’ve gone through this box the fastest. One common piece of machinery to make liposomes is a microfluidizer, it basically shoots a stream of product at a very thin blade, the turbulent forces causes the particles to fracture and become very, very small and all the same time become encapsulated in liposomes. Those machines run slowly and cost in the hundreds of thousands if not more for production scale. And of course the hyaluronic acid isn’t the only beneficial ingredient in these sheet masks. Many brands would take the concept of a hyaluronic acid hydrating mask as an opportunity to throw a bunch of water, glycerin, glycols, preservatives, and fragrance in there around the HA and call it good. As you can see from this mask’s ingredients list, My Beauty Diary doesn’t take that approach. The essence contains all manner of beneficial extracts to provide a much more well rounded product than many daily-use essences or hydrating serums. Amazon seems to be experiencing a shortage of these masks similar to the Squalene drought, but a few boxes of 8 can still be had for $12.44 with free shipping*. That’s it for the 2015 My Beauty Diary sheet masks that I’ve tried so far! I’ve definitely got my eyes open for more varieties, and I have a whole bunch of other less-standard MBD flavors to work through still, so I’m sure you’ll hear more about this brand from me in the near future. What are your favorite MBD sheet masks? This post makes me so excited! I love Taiwanese masks, and I love Taiwan–delicious food, safe (much safer than China! ), and a place that has the best traits of Japan and China but is more laid-back and less stressful than either, as well as having its own unique qualities. I’m going there the middle of next month (invited to participate in a poetry festival in Hualien) and am going early to spend a few days in Taipei to eat all of the dumplings and shengjian bao and other goodies and shop for Taiwanese beauty products, especially masks. I have two of the Annie’s Way and love them (though they always make me hungry)–the Arbutin + Hyaluronic Acid Brighting Jelly Mask and Aloe Anti-Acne Jelly Mask (that also contains seaweed). Also love Lovemore, L’Herboflore, Maskingdom, and My Pingko Girl, but haven’t yet tried My Scheming. I’m planning to visit the Maskingdom flagship store in Ximen and know I’m going to want to purchase every single mask because the packaging is so beautiful. The famed illustrator Jimmy Liao designs some of the packaging for one of the brands (I think L’Herboflore), and I like how Maskingdom really highlights Taiwanese culture, including aboriginal culture. I could go on and on, but instead I am going to get back to my shopping and food planning. I look forward to your reviews of all of these wonderful masks, and I look forward to starting a museum of these lovely masks that are too pretty to use, LOL. Sorry I don’t mean to get ~political~ but I’m also a history nerd and like Taiwanese products 😛 but I’ve read that the treasures at the National Palace Museum are basically stolen from China..? I’ve tried the Hey! Pinkgo girl Marine Collagen mask (which is A+), but I haven’t gotten around to purchasing any MBD masks yet. Looks like a good time to try! I have mad respect for you. I have reached the same conclusion on all things bird’s nest for the very same reasons. Luckily for me all I have is the SNP bird’s nest cream, which I dislike anyways. Have you tried the Pure Mind ones? I ask just because they are super cheap on ebay but that doesn’t mean that they are good. Yeah, they are on ebay for 60 masks for $40. On the one hand I’m screaming “WHAT A DEAL!” But on the other hand it is hella lot of masks to use up if I don’t like them. I’ve tried some of the newer versions of MBD and I must say they are absolutely amazing to me too. My favorite is the Tranexamic masks but I really want to try the Lipsome Hyaluronic Acid ones now! I have yet to try MBD but my current mask stash is ever so slowly shrinking and I know that there is an Asian beauty store that sells MBD packs…..
first of all, thank you for the interesting post and blog. I am newbie at korean skincare, so I am not entirely sure when to apply a mask. Do you apply it after the toner or after the serums? It's been a long time since I've used anything from MBD. Is there much of a fragrance? I tried one natto masks years ago after randomly buying it at the supermarket and remember being bothered by the smell (strangely, I HATE natto, even though the concept is pretty similar with stinky tofu… ) but the new masks sound really nice and I want to get some! Oh my gosh, the new cut of the MBD masks is driving me crazy. And giving me a complex about having a fat face! So much so that I drew a cartoon about it (http://www.yangjanice.com/2015/08/i-think-my-face-mask-is-trying-to-tell.html). BUT, I LOVE THEM. I will have to try cutting them, if I can get over my laziness. Also, stinky tofu is the BEST. I refused to eat it when I was a kid but then my mom said the magic word “fried” and I was like GIMME. Sadly, all the authentic Taiwanese places in my town closed and I can’t get this anywhere. I can’t wait to go back to Taiwan and eat my face off. I went a bit crazy and bought a bunch of the updated versions when they were on sale on Prime. I am in love with the new fit, the old versions were way too big for my face and had a hard time keeping them on my face! I would love to have a visual of where you rank masks for their promised properties (i.e. Hydration, brightening, firming, soothing, ect) against each other. For example, I’m curious to know how you feel the hydration and plumping of the MBD Hyaluronic Acid mask compares to the DressCode Blue that you were impressed with. Ooooooh. That sounds like a fun project for me. Stay tuned! AHH! I’m doing so much to force myself to not buy these new masks…I still have so many of the older version that I need to use up before I’m letting myself buy the new ones (at least that’s what I’m telling myself). I’m quite curious though — is the mask material anything like the Freeset Donkey Milk ones? Because that’s what I keep imagining they are like! Nope, nothing at all like that! I tend to buy face masks randomly without much research so I appreciate your reviews, especially the ones that talk about smoothing wrinkles, because sometimes having people yell, “you’re showing emotion” when I move my face isn’t enough to keep the wrinkles away. I am trying to be more intentional about the effects so this is helpful. I do that too (buy sheet masks without much research), especially since a lot of the time, I can’t find ingredients online! So I just pick based on, like, “uh, this sounds pretty good” or sometimes even “that’s so cute”! And this process can result in some serious fails, so I’m glad my reviews are helpful to you! HAHAH! Thanks for the laugh! I realize I’m a little late to this post but THANK YOU for the review. I happen to be in Taiwan for a few weeks and when I went to Cosmed for a hydration fix and saw a sale on MBD masks (2 boxes of 10 for NTD 399) your reviews helped me choose between the many options. Love your blog! Because I buy sheet masks without much consideration, too, I’ve decided to Google the Squalene mask *while* it is on my face, which is how I’ve ended up here again. 🙂 The fit and the material are amazing (even though the eye holes are quite small, but I’ll live,) but you scared the hell out of me with your initial experience of feeling like your skin was burning off (or something, right?) Anyhoo, wearing it alone makes me understand all the MBD mask hype. Some masks are really more of a chore to wear, but this feels great. I really need to resist the urge to buy some more, though, because I have all these other random ones to go through. MBD FTW! Hi mi nombre es Marina de 42 años, como puedo conseguirlas? vivo en Tijuana, Mexico. pero tengo dirección en San Diego, Ca. estoy interesada en adquirirlas, que precio tiene, donde se les deposita, en cuanto tiempo llegan??.. information please!!! thanks. An underrated life-saver for me is SexyLook! Always soothes redness/scars for when I get hormonal breakouts. I’ll have to bite the bullet and try Beauty Dairies soon!